Estate sales are a very odd beast. You are essentially in a front row seat to someone’s life, who is a complete stranger. In their home, in their absence, every drawer, closet and cupboard is thrown wide open for display and inspection. And honestly, you come across some pretty odd things. I am not a big follower of estate sales, but my friend Debbie at work and her mother are. On a drizzly Saturday morning a few weeks ago, she texted me saying they were in line at an estate sale about 5 minutes from my house. I zipped down there and met them. The house was amazing – almost a museum. The owners had clearly traveled the world, and had a wide range of varied interests. It was filled with paintings, sculptures, wood carvings and some very unusual furniture. Quite unforgettable. And all I bought was a little dish towel with a rooster on it. But it was the NEXT estate sale we visited that inspired this post. The house was literally nearly empty; it was the 3rdday of the sale. And it was a small house. In a bedroom was display of white ceramic ware. My white-pitcher-radar lit up, and sure enough, a petite pitcher jumped out at me. 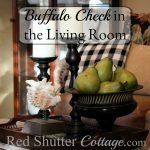 I continued to wander through the kitchen and a family room, but didn’t really see anything else I found interesting. And then I noticed these two in a small hutch in the living room. It’s the ears. I love those ears. So ridiculously long and unusual. And the fact that one is sitting down and the other is standing up. 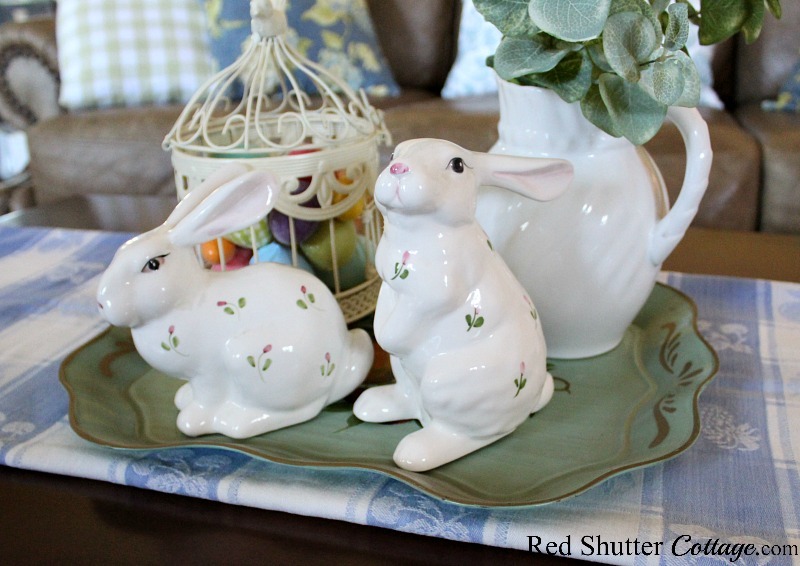 I chose them to be the center of an Easter vignette on our coffee table. The next order of business was pulling down the Easter bin. 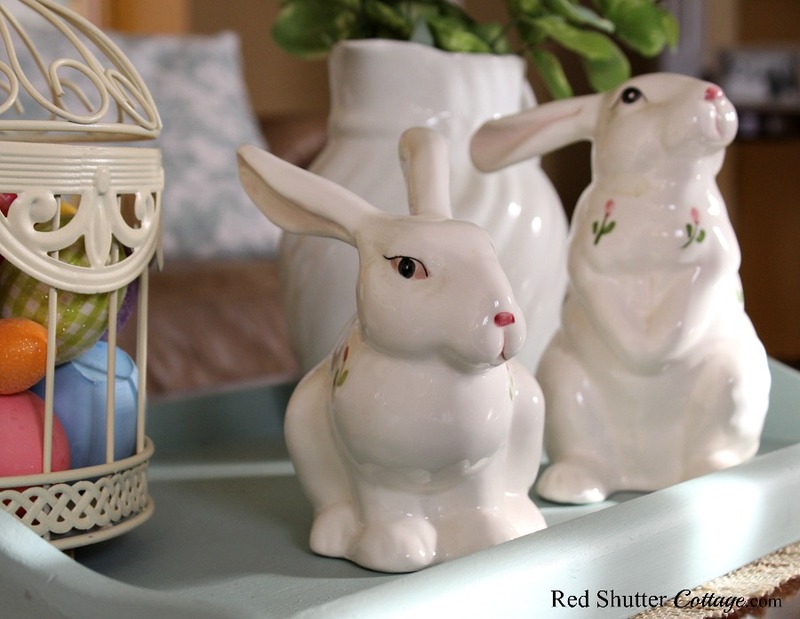 I considered combining my new ‘rosebud’ bunnies with some of my other thrift shop bunnies, but I didn’t think they mixed well. Then I moved on to the small collection of pastel eggs I have, and realized they would play nicely with the rosebud bunnies. But what to put them in? I settled on this birdcage (from a thrift shop) that I spray painted antique white. (Here’s the link to that post.) And to add some greenery, a white pitcher with some pretty and bright green leaves. 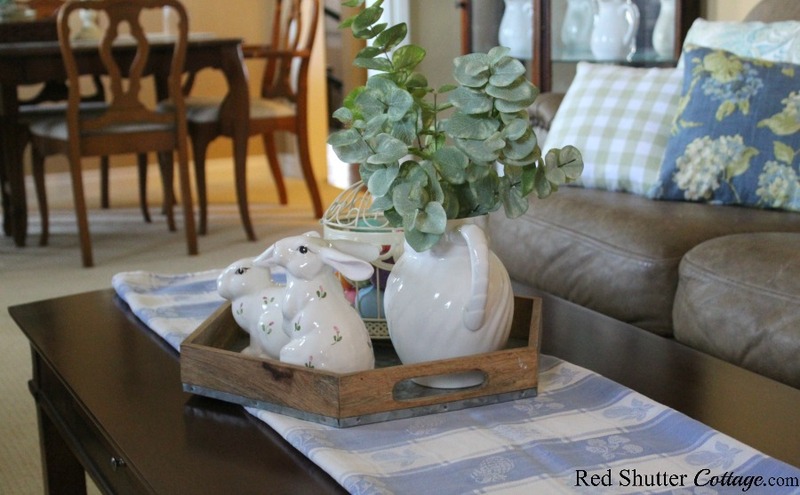 The next step was to select a runner and a tray to act as a foundation for this vignette. For the runner, I had a couple of options: an old blue and white summery tablecloth I have had for years, and my default go-to, a neutral straw runner. For the tray, I actually had 3 options to play around with: a wood tray from a thrift shop that I had painted a light turquoise; my Mother’s Tole tray that I think is just beautiful, and a metal and wood 6-sided tray that I bought a few years ago. I played around with various combinations of runners and trays. Here are what the mix-n-match combinations looked like…. But I quickly realized it was the tablecloth that wasn’t working. The ‘blue’ in the blue & white table cloth did not harmonize with the pillows on the couch; the color values of the blues were too different. The blues in the pillows have some green undertones to them, while the blue in the tablecloth is more of a cool gray blue. 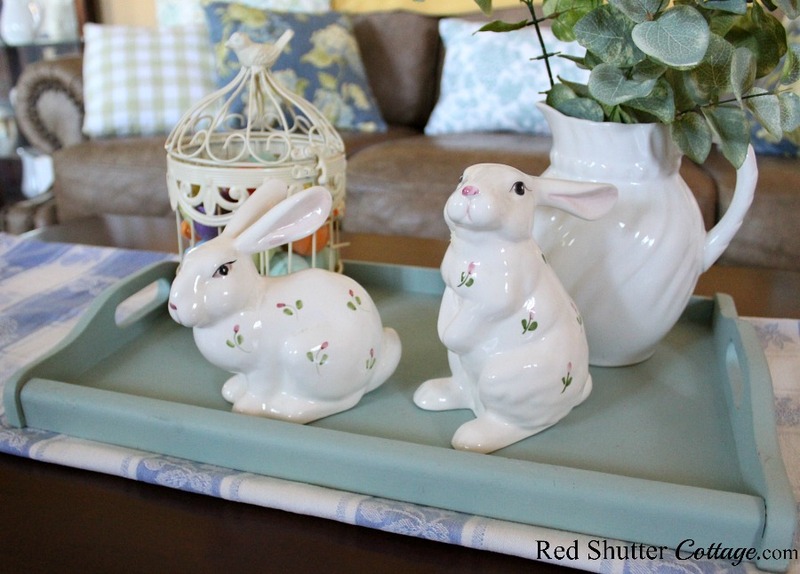 I also realized that the Tole tray wasn’t a good for the Easter vignette. 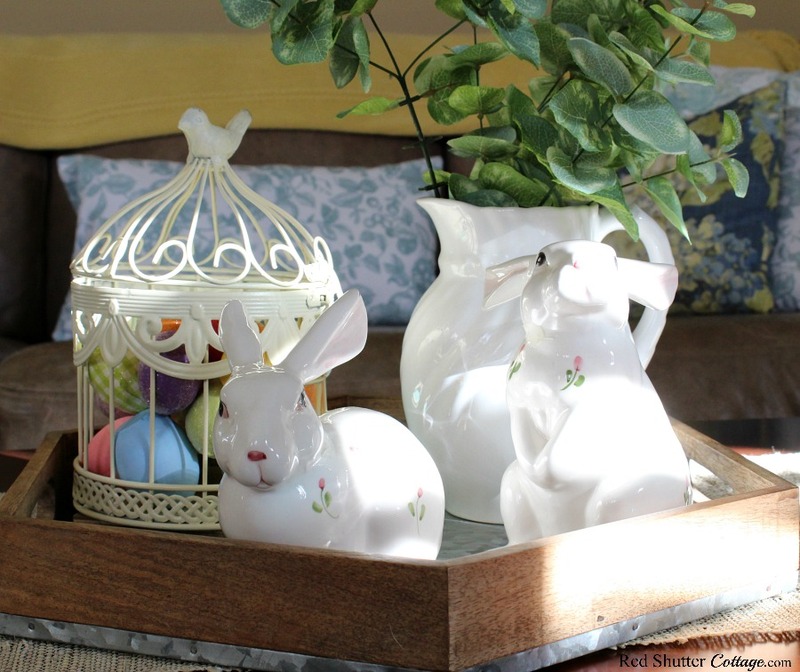 The beautiful floral painting in the middle was completely hidden by the bunnies, bird cage and vase. So, I replaced the tablecloth with the straw runner. First, I tried it with the turquoise tray. And then I tried with the wood and metal tray. Honestly, I like them both, although I might be a teensy bit partial to metal and wood tray. I like how it corrals all the items close together. 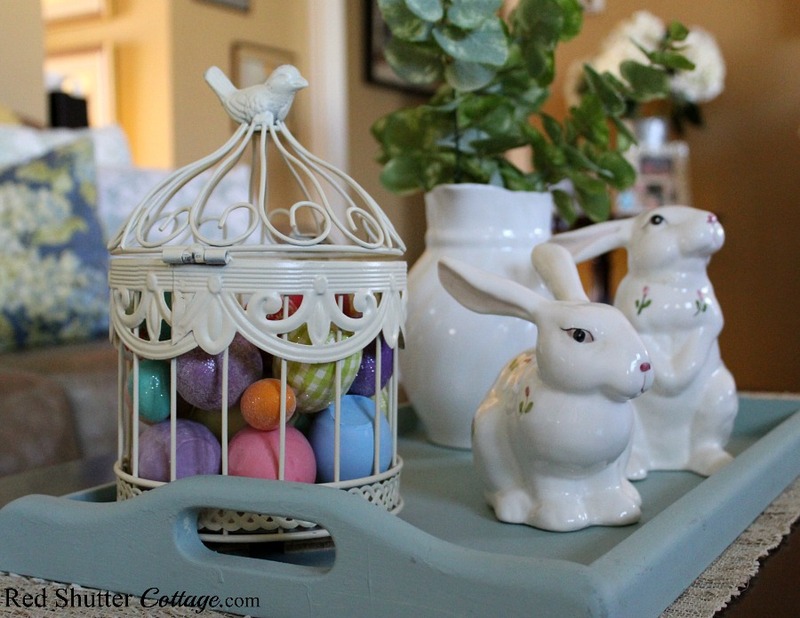 You might notice that in this little vignette, there are only 2 “Easter” items; the pair of bunnies, and the pastel eggs. Everything else – the runner, the tray, the bird cage, the pitcher, the greenery, even the pillows on the couch – are all generic. They are not even necessarily ‘spring’ decor. They are just simple, every day accessories. I have found this to be true a few times over the course of the last few months. 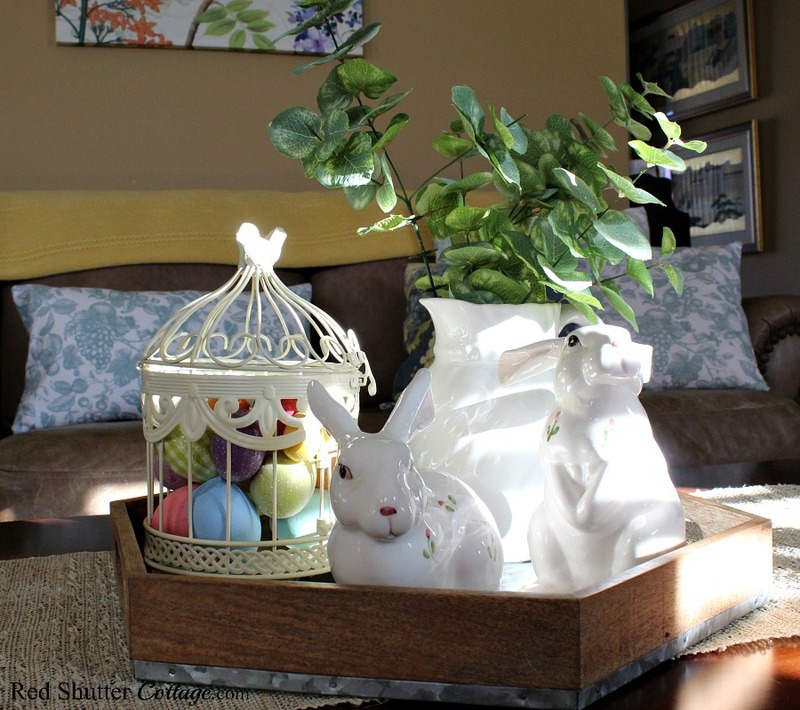 I don’t need a tubful of Easter items (although I DO have one!) 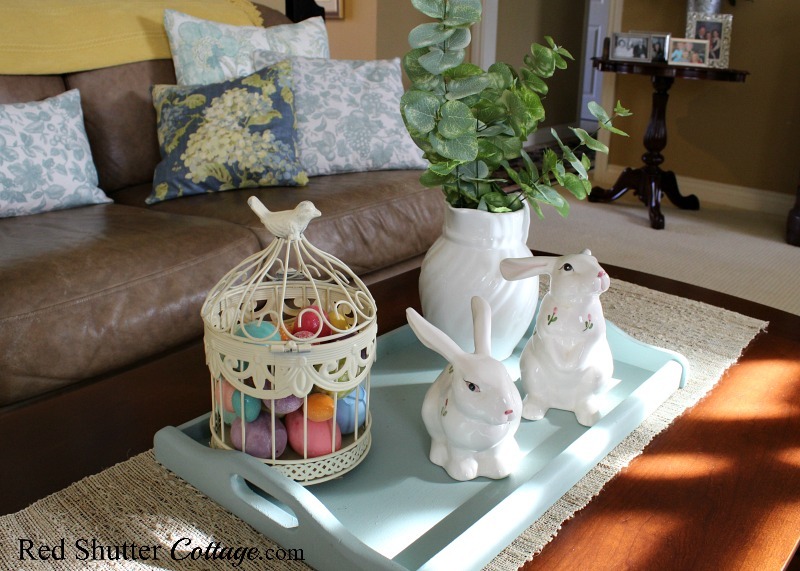 to create an Easter vignette. 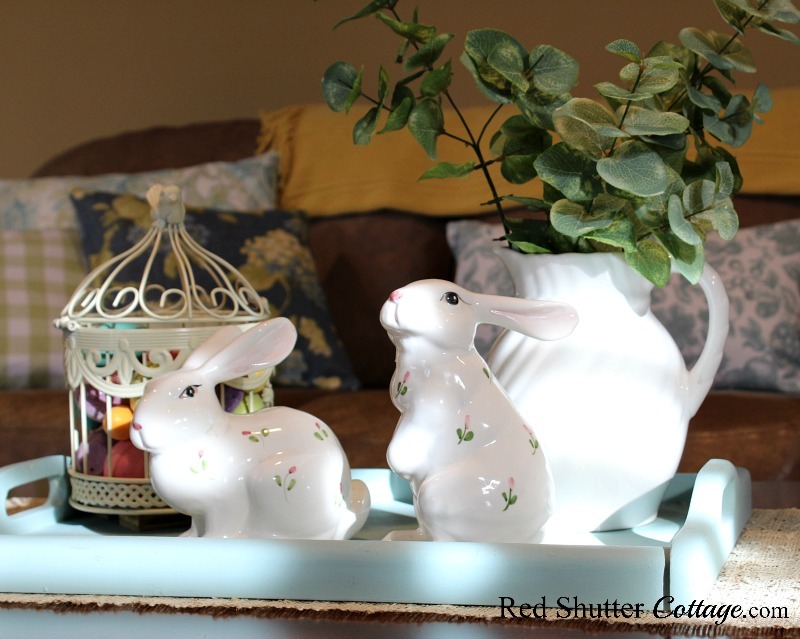 Just a few seasonal pieces, supported by complementary accessories, can create a cheerful Easter display. 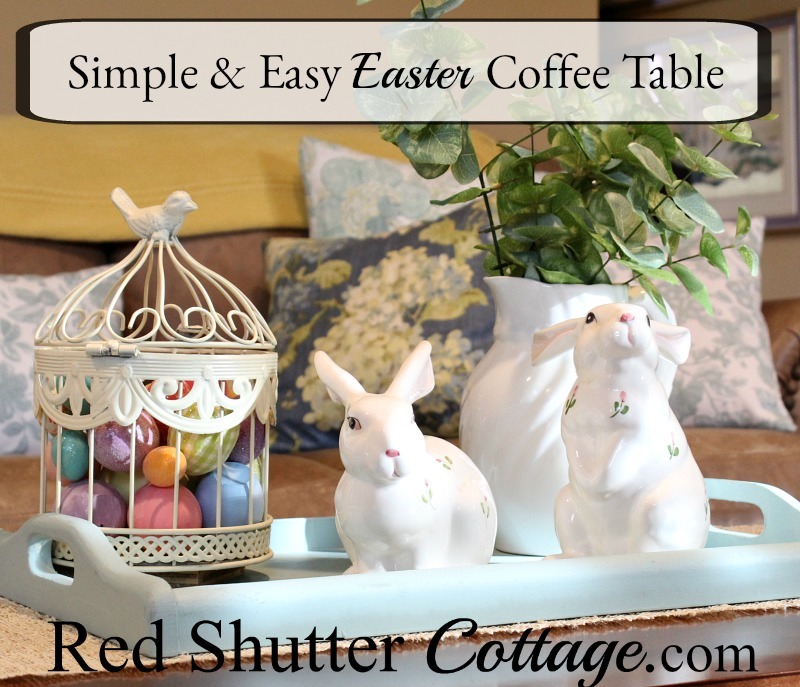 That is why I called this a simple and easy Easter coffee table! Creating vignettes for any season or event that are pleasing to both your eye and your heart means gathering all kinds of different accessories to mix and match and see comes about! You never know what will ‘feel right’ until you swap random items in and out until it clicks. Sometimes what seems perfect in your mind’s eye falls short in execution. Test, replace, reposition and retry again until it feels right! And visit an estate sale once in a while – you may find new treasures! 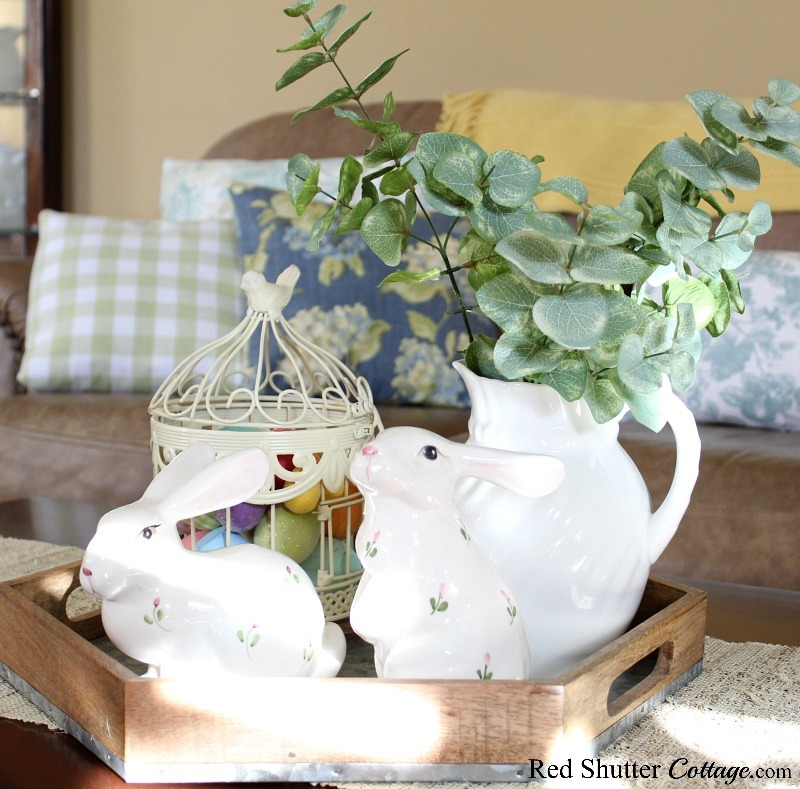 From our home to yours – Happy Easter! I am participating at these Link Parties! Thank you Nancy !! Happy Easter to all of you – even the new little one! How wonderful to have a special bunny made by your grandmother. Yes indeed, keep it high so that when she grows up, she has a special bunny made by her Great-Grandmother! I will have 11 at my Easter table, and I am truly looking forward to it! Thank you so much for stopping by, and best wishes to you for a wonderful Easter! SO SO CUTE! lOVE YOUR PILLOWS TOO. THANKS FOR SHARING AT TFT! Thank you Amber! Pillows seem to be my kryptonite! I have an embarrassingly large inventory, but they really impact the feel of a room! Thank you so much for stopping by, and hosting TFT !! Barbara- Thank you so much for the feature! I am thrilled and honored! And please know how much I appreciate you hosting “Share Your Style” link party. Best wishes for a wonderful Easter to you and your family!